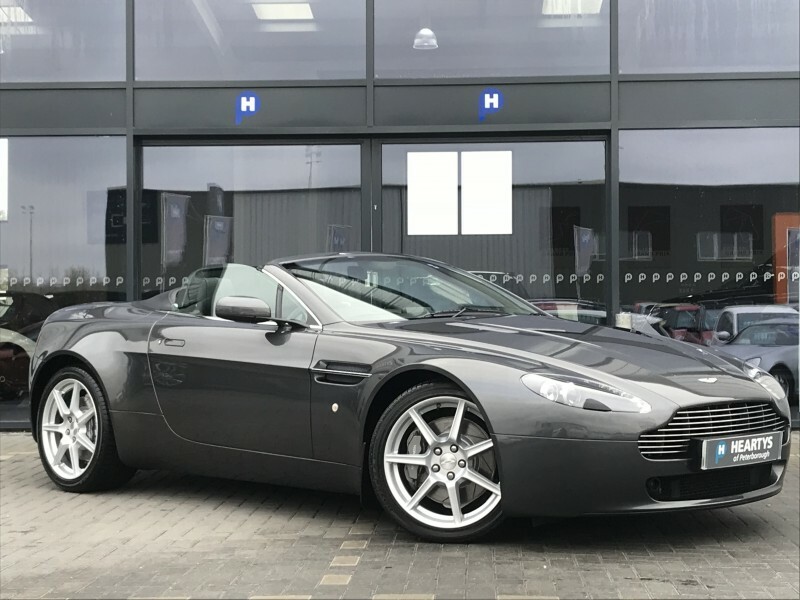 BUY THIS SUPERLATIVE LOW MILEAGE ASTON MARTIN VANTAGE 4.3 V8 ROADSTER SPORT-SHIFT FINISHED IN METEORITE SILVER WITH FULL HEATED ELECTRIC MEMORY BLACK LEATHER SEATING,1 PRIVATE OWNER FROM NEW WITH A FULL ASTON MARTIN DEALER SERVICE HISTORY, 12 X SERVICES AND LAST SERVICED ON THE 10/10/18 @ 32,806. HEARTYS OF PETERBOROUGH, A FAMILY RUN BUSINESS BASED IN PETERBOROUGH ESTABLISHED IN 1968, WITH ALL OF OUR CARS HPI CLEAR, AND INDIVIDUALLY SOURCED, WITH SERVICE HISTORY, AND FANTASTIC FEATURES SUCH AS... (FULL ASTON MARTIN MAIN DEALER WALTON ON THAMES SERVICE HISTORY WITH 12 X STAMPS IN THE BOOK, LAST SERVICED ON THE 10/10/18 @ 32,806 MILES) FLEXIBLE FINANCE DEALS AVAILABLE - ....GREAT PART EXCHANGE DEALS AVAILABLE.....CALL NOW FOR DETAILS... ALL CARS COME WITH A COMPREHENSIVE 3 MONTH WARRANTY - VISIT OUR WEBSITE FOR OVER 250 VEHICLES IN STOCK - www.heartysofpeterborough.co.uk NO ADMIN FEES!! Aston Martin Vantage V8 Roadster 4.3L 2dr.